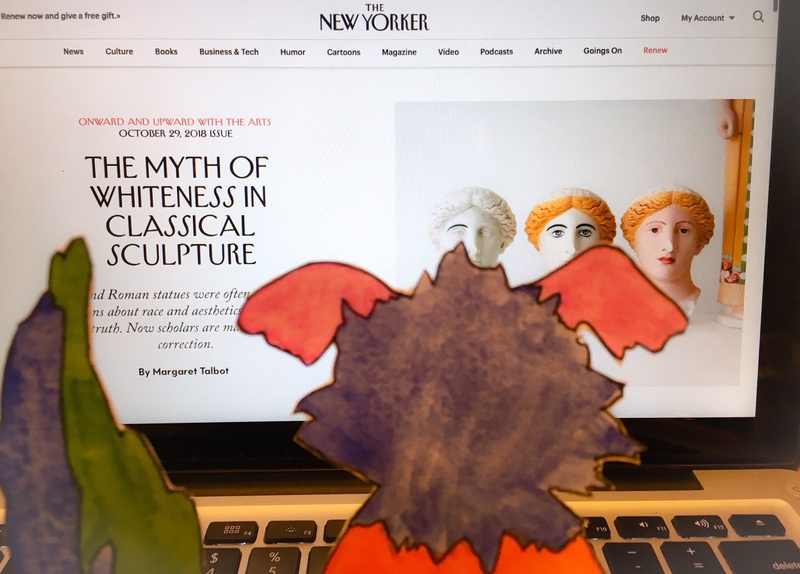 Marabou would like to draw your attention to an article from the October 29, 2018 issue of The New Yorker addressing the widely-accepted myth that Classical Greek and Roman sculptures were always white marble. Written by Margaret Talbot, the title of the print version is “Color Blind,” the digital version (accessible here) is entitled, “The Myth of Whiteness in Classical Art.” Marabou appreciates this article because it continues the campaign of telling a historical truth, that the Classical pasts of Greece and Rome were not pristine white, but vibrant and colorful. The article also explores why the evidence and reality of a polychrome Classical world has been hidden and deemphasized by scholars for over 100 years. Pushing even further, the article asks why the public is generally unwilling to accept the reality of a technicolor ancient world and why those willing to believe deem the saturation and hues as gaudy and ghastly. “was easy to see, even with the naked eye.” Westerners had been engaged in an act of collective blindness. “It turns out that vision is heavily subjective,” he told me. “You need to transform your eye into an objective tool in order to overcome this powerful imprint”—a tendency to equate whiteness with beauty, taste, and classical ideals, and to see color as alien, sensual, and garish. Marabou finds Brinkmann’s statement reflective of misinterpretation incidents when it comes to understanding cultures, especially those that are not European. Interpretations of cultures and art have been strongly influenced by western implicit bias. One example is Jean-Frédéric Waldeck, a French artist who was sent to present-day Mexico and Central America in 1832 to document Mayan writing. There was a belief at this time that Mayan cities could have been built by Babylonians, Phoenicians, or Hindus (implying the indigenous people of the region could not possibly have been capable of such architectural feats). With this belief in the zeitgeist, Waldeck, who was supposed to draw-record-the Mayan hieroglyphs as they are, interpreted elephants (that are not there) in the writing, further bolstering the hypothesis that cultures from the other side of the world imparted their knowledge with the indigenous people of Mesoamerica and built magnificent cities for them. (Find out more about the deciphering of the Mayan language by watching the PBS Nova episode, “Cracking the Maya Code.” Start at minute 9:00 for information on Waldeck.) This incident is a perfect example of Brinkmann’s assertion “vision is heavily subjective…You need to transform your eye into an objective tool in order to overcome this powerful imprint.” Marabou thinks about how pervasive implicit bias and subjectivity are in present-day museums. why providing platforms for marginalized populations to share their stories is somehow threatening to the status quo. Talbot ventures into the discussion of race in Ancient Greece and Rome, but just a little bit. She touches on present-day white supremacist groups using Ancient Greece and Rome as model white societies and use of white marble statues as “as emblems of white nationalism.” Marabou expected more exploration of this topic with a title like “Whiteness in Classical Art/Color Blind.” However, talking about race in classical European art deserves an article (a book, an anthology) all its own. Marabou wonders how society would look if, from the outset, all of us were taught that the sculptures and art of Ancient Greece and Rome (and Egypt, Mesopotamia, and other ancient cultures) were colorful and depicted people of different skin tones, from dark to light. What would history look like if whiteness, paleness of the skin was not framed as better, superior to darker skin tones. What would happen if we were able to break, as Talbot states, this “tendency to equate whiteness with beauty, taste, and classical ideals, and to see color as alien, sensual, and garish.” We are taught to think in a certain way and these thoughts guide our actions. It’s important to reflect on how deeply we are conditioned to think a certain way about history and how challenging it is to break others and ourselves out of this conditioned mindset. The discussion of whiteness in classical Greek and Roman art and resistance to acknowledging and accepting the reality of color is a microcosm of bigger contemporary issues around race. When Talbot highlights Mark Abbe’s question, “Who benefits?” from believing classical sculptures were always bright white marble, she and Abbe are also speaking about the fear and loss felt by those who benefit from white supremacy when there are social and political moves toward equity for those historically marginalized. Marabou asks, what is lost through the acceptance of a polychrome and multiracial Ancient Greece and Rome? Is it possible to help people see the idea of a colorful and multiracial world – both ancient and present-day – as a gain and win for everyone instead of a loss?